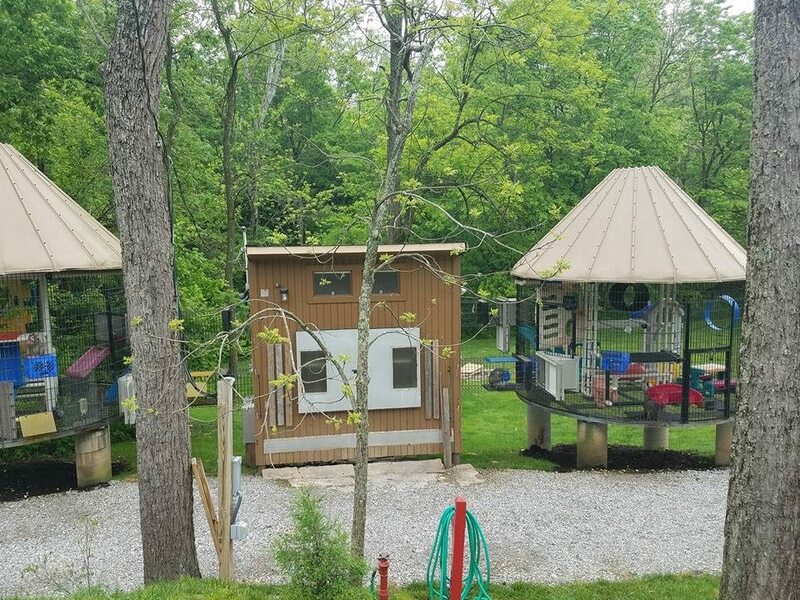 The Primate Rescue Center is nestled on 30 acres in central Kentucky, with buildings and grounds designed to afford the animals a quiet, sheltered place to spend the rest of their lives. The centerpiece of the sanctuary is a state-of-the-art chimpanzee enclosure—currently home to 9 chimpanzees—that was completed in the summer of 2006 and since updated with climbing structures and other improvements designed for the chimpanzees’ enrichment and comfort. An enclosed tunnel allows the chimps to choose where they want to spend their time and move between the spacious outdoor enclosure and their temperature-controlled sleeping and playroom areas. In addition, the PRC features 10 custom indoor/outdoor monkey enclosures with heated houses; the nearly 40 primates occupying these enclosures can also choose where they wish to spend their time, and, except in the most inclement weather, most venture outdoors for at least part of the day. Providing a well balanced and nutritious diet for so many apes and monkeys is a monumental task: on an average day, our staff, volunteers, and interns process 300 pounds of fresh vegetables, fruit, lettuce, nuts and grains and prepare the primates’ meals in our industrial kitchen. The Primate Rescue Center is a tax-exempt, nonprofit organization that receives no direct funding from the federal government or the state of Kentucky. We rely on donations of money, supplies, and in-kind serves from individuals, service providers, foundations, and our corporate partners. You can help too! See our Wish List for a up-to-date list of the food items, equipment and supplies of particular items we need most. We accept donations both by check and online. (Complete information about how to donate is available here.) Those interested in supporting our lifesaving work may also donate vehicles, stocks, bonds, and securities or make in-kind donations, all of which are tax-deductible to the fullest extent of the law. Contact us for details. The PRC is proud to have been designated a Better Business Bureau Accredited Charity, which assures our commitment to accountability and ethical charitable practices. In addition, we are one of fewer than 2,000 nonprofit organizations (of more than 1 million operating today) granted the Seal of Excellence by the Independent Charities of America—a distinction only awarded to those able to demonstrate the highest standards of public accountability, program effectiveness, and transparency. In 2013 we were voted a Great Nonprofits Top-Rated Nonprofit and have been every year since. Finally, the U.S. Government has approved us to participate in the Combined Federal Campaign, deemed to be the world’s most exclusive fund drive. To help you further assess our success in fulfilling our mission, each June we post online our Annual Report (764 KB PDF) from the prior calendar year. as well as our most recent IRS Form 990, which provides details on how revenues are raised and spent. These documents can be found on our Financials Page and include financial data from our annual IRS tax filings and our final audited financial statements. How long has the Primate Rescue Center been in operation? 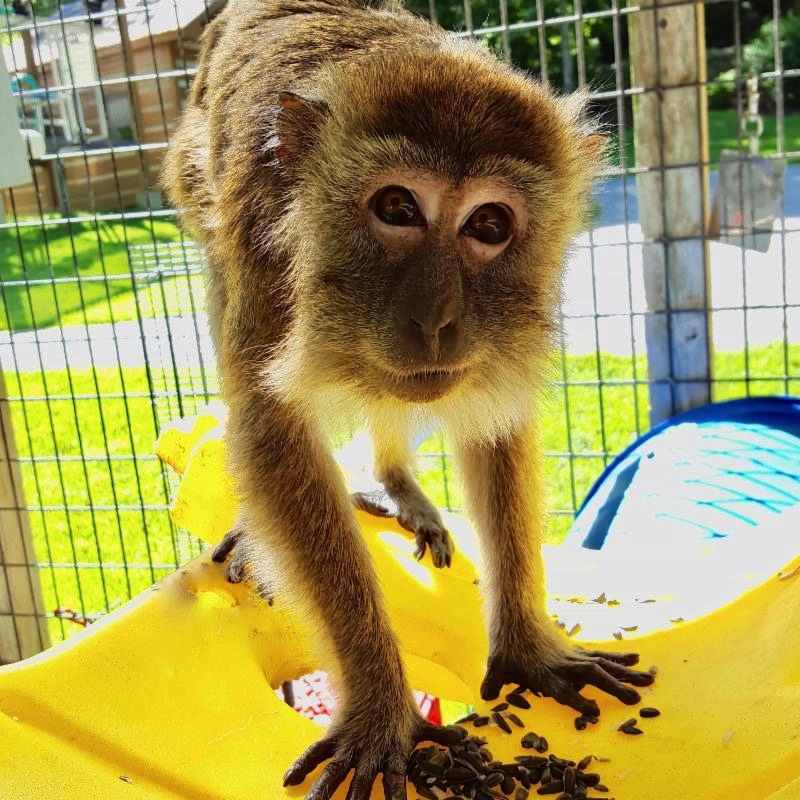 The Primate Rescue Center has roots dating back to the late 1980s, when Clay Miller purchased a long-tailed macaque and presented him to April Truitt, his future wife, thinking the young monkey would be a perfect household pet. The couple realized that young macaque, Gizmo, needed a companion of his own species, they discovered a large population of once-beloved pet monkeys who had outgrown their welcome as they got older, stronger, and more unpredictable. So they built more enclosures for some of those unwanted primates, and before long they also agreed to provide homes for retired laboratory animals, a monkey who had injured his owner, and some illegally owned pets who had been confiscated by authorities. 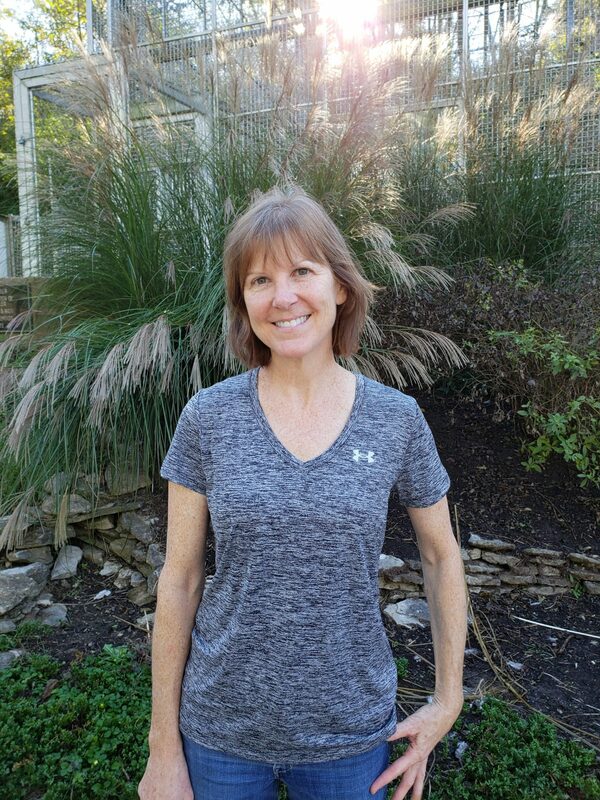 From those accidental beginnings the PRC has grown into a nationally respected sanctuary, with Truitt volunteering her time as executive director until her retirement in September 2017. Her successor, Eileen Dunnington, will usher the PRC into the next chapter and continue the life-saving work April began 30 years ago. How large is the facility? 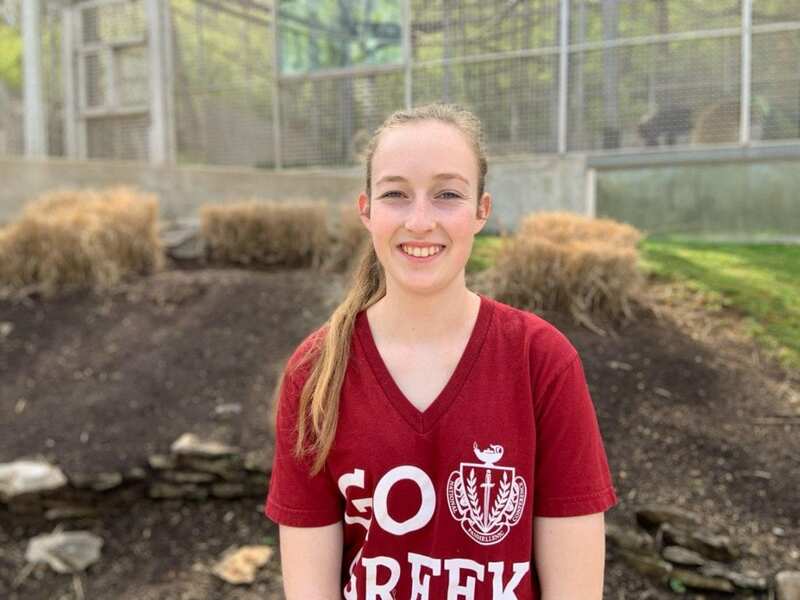 The Primate Rescue Center is nestled on 30 acres in central Kentucky, with buildings and grounds designed to afford the sanctuary’s animals a quiet, sheltered place to spend their lives. The centerpiece of the sanctuary is a state-of-the-art chimpanzee enclosure that was completed in the summer of 2007. 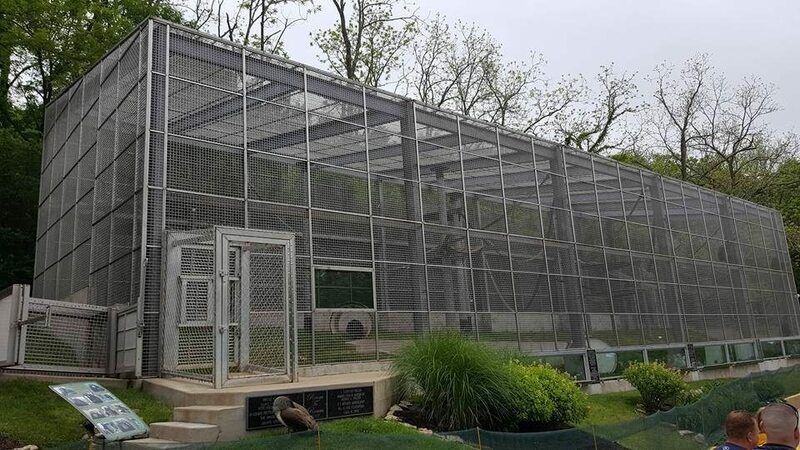 In addition, the PRC features 10 custom enclosures with heated indoor areas; the social groups of monkeys living in these indoor/outdoor enclosures are free to choose where they wish to spend their time, and most spend at least part of the day outdoors. Is the PRC open to the public? The PRC is not a public attraction, and does not offer public visiting hours. Unlike zoos, theme parks, “pseudo-sanctuaries,” and other public attractions, we strive to ensure that the animals under our care live in as stress-free an environment as possible. Although visitors may be well meaning and well behaved, some of our residents are wary of strangers and very protective of their territories. We do, however, host a single-day, invitation-only open house each spring for members and supporters, which gives them the opportunity to witness firsthand how their donations are being used. How many animals does the Primate Rescue Center care for? Our capacity – and our current population – is just under 50 monkeys and apes. The PRC is currently home to 9 chimpanzees, and 40 monkeys: crested black macaques, capuchins, long-tailed macaques, pigtail macaques, rhesus macaques, a Japanese macaque, spider monkeys, vervet monkeys, and an elderly siamang gibbon. We also have peafowl roaming the sanctuary grounds. They function as part of our clean-up crew, and our early-warning system should there be any unusual activity on the property. 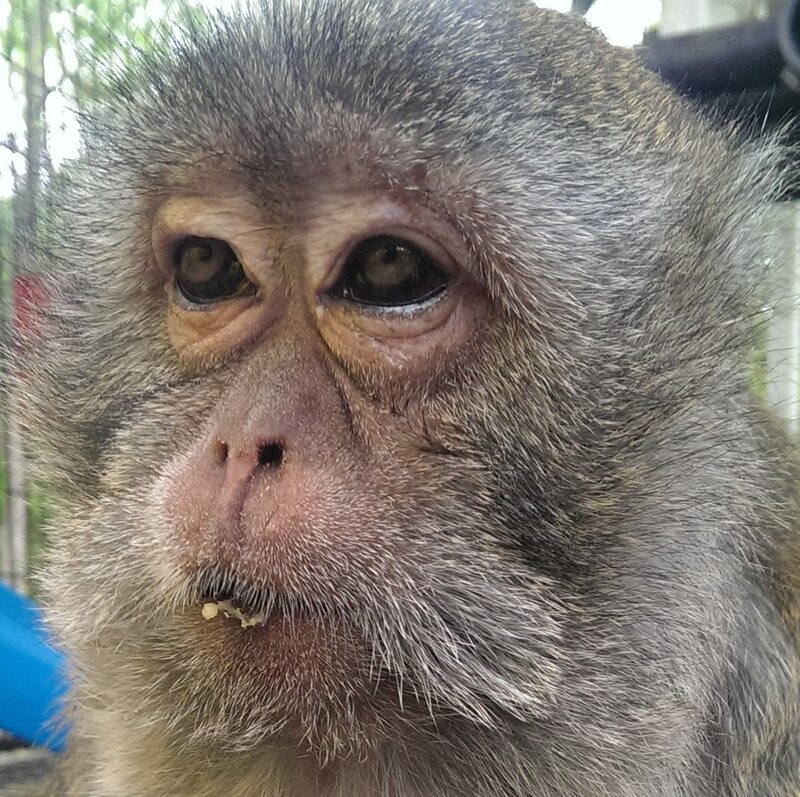 Some of the monkeys living at the PRC spent years as subjects in biomedical research; others were confiscated from those not licensed to keep them. But most of the Center’s monkeys are former pets whose owners were unable to provide them with the specialized care required for these exotic wild animals and turned to us for help. This is an often-repeated scenario in the primate trade: individuals pay dealers hefty fees for cute, cuddly, and dependent babies, only to find they’ve made a terrible mistake when their growing “pets” become stronger, wilder, and potentially dangerous. In some cases, monkeys arrive here after having seriously injured their owners or others. We provide lifetime care to these individuals who have no other options, and as part of our mission we also educate the press and public about why owning a monkey may be perilous for everyone involved, especially the monkey or ape. Are the Center’s chimpanzees and monkeys encouraged to breed and produce offspring? We adamantly believe that our primary responsibility must always be providing the very highest quality care to the primates currently living at the sanctuary. We have limited capacity to take in new residents, and we know that each new addition means that there may be no space available for the next needy individual. Producing offspring would make us part of the problem rather than a part of the solution—a role we cannot and will not embrace. We house our residents in groups whenever possible, but use contraceptive methods that allow for normal social interactions. How much money is required to care for each animal? There are no across-the-board fees for our residents’ care, as some have unique dietary or medical needs. For example, some of our monkeys were so malnourished during their infancy and adolescence, they arrived at the PRC with bone disease; others, fed little but sweets and junk food, developed diabetes—a condition that requires we administer expensive medications for the rest of their lives. Our heating bills soar during colder-than-usual winters, pushing the average cost of care higher for all our residents. If an enclosure needs repair or maintenance, we may need an outside contractor to fix or modify it. When an animal is injured or becomes ill, our veterinary bills unexpectedly rise. And the costs of care may also increase if we need new refrigerators or equipment. In short, we have estimated that each chimpanzee requires a minimum of $15,000 per year and each monkey requires a minimum of $6000 for their yearly care costs. However, the cost of caring for one chimpanzee or monkey, for example, may be some multiple of the cost of caring for another. Does the PRC get financial assistance from the federal government or the state of Kentucky to help cover these costs? The Primate Rescue Center is a 501(c)(3) tax-exempt, nonprofit organization and receives no direct funding from the federal government or the state of Kentucky. In fact, most of our supporters are surprised to learn that there is no source of government funding available to underwrite our work. We instead rely on generous donations of money, supplies, and in-kind services from individuals, service providers, and our corporate partners. See our Wish List for a catalog of the equipment and supplies of particular value to us. How can I donate to the PRC? As a nonprofit organization that receives no governmental funding, we rely on the generosity of foundations, businesses, and individuals. Grants from foundations have helped us expand our chimpanzee quarters and increase our storage capacity and general efficiency, while local grocers have over the years provided us with ongoing donations of produce and other foods. Because such donations still leave a hefty shortfall in our annual operating budget, we rely on donations by individuals to cover our Animal Care Program costs, including veterinary bills, employee salaries and benefits, utilities, maintenance, and all the other costs directly associated with providing our residents top-notch care. We accept donations both by check and online via Paypal or GIVEDIRECT, a nonprofit service that processes credit-card payments for us. Those interested in supporting our lifesaving work may also donate vehicles and securities or make in-kind donations. Contact us for details. If you would like to help our residents, check out all the ways you can Donate Now. How can I be certain that my donations are being well spent? We could not exist without the contributions of our members, and we therefore make every effort to earn (and then keep) the trust of donors. We start by being as transparent as possible in our sanctuary dealings: every year, we post online for public inspection our IRS Form 990, which provides details on how revenues are raised and spent. The PRC is a Better Business Bureau accredited charity, which assures our commitment to accountability and ethical charitable practices. In addition, we are one of fewer than 2,000 nonprofit organizations (of more than 1 million operating today) granted the Seal of Excellence by the Independent Charities of America—a distinction only awarded to those able to demonstrate the highest standards of public accountability, program effectiveness, and cost effectiveness. Finally, the U.S. Government has approved us to participate in the Combined Federal Campaign, deemed to be the world’s most exclusive fund drive. Do you have a special veterinarian who provides medical care? Chimpanzees and monkeys have special medical needs that most veterinarians are not willing—or trained—to address. We have been extremely fortunate, however: for the last two decades, Dr. Dan Bowling and his staff at the Animal Hospital of Nicholasville—a few short miles from the PRC—have provided our primates outstanding care. Although the hospital caters primarily to companion animals, Dr. Bowling has been extraordinarily adept at keeping our residents in good health, skillfully diagnosing and treating everything from injuries to infections and, when necessary, reaching out to other practitioners for life-saving advice. Does the PRC use volunteers? We have a very active and robust volunteer program, and we’re always grateful for the hard work these dedicated individuals perform. Some of our volunteers work onsite, where they help with everything from general maintenance and cleaning to preparing the animals’ food and creating engaging enrichment activities. Other volunteers, who are unable to make a weekly time commitment, may perform off-site volunteer work or represent the Center at special events. Look here for more information about our many volunteer opportunities. Where can I learn more about the issues involving the private ownership of primates? We have devoted an entire section of our website to key issues involving primates, including their use in research, entertainment, and the pet trade. In addition, we regularly feature issues involving the private ownership of primates in our email newsletter, so we’d urge you to sign up for that on our homepage. And both our blog and Facebook page also highlight stories related to these issues, so we’d urge you to become a regular reader of the former and friend us on Facebook. For those who want to delve deeply into all issues related to the private ownership of primates, we highly recommend Animal Underworld: Inside America’s Black Market for Rare and Exotic Species. Authored by Alan Green and the Center for Public Integrity, this eye-opening, award-winning book is the definitive look at the trade in primates and other non-native species. We’re proud to be featured in the book as an exemplary sanctuary. You can read our review of it here. PRC Volunteer Program – A Full House!